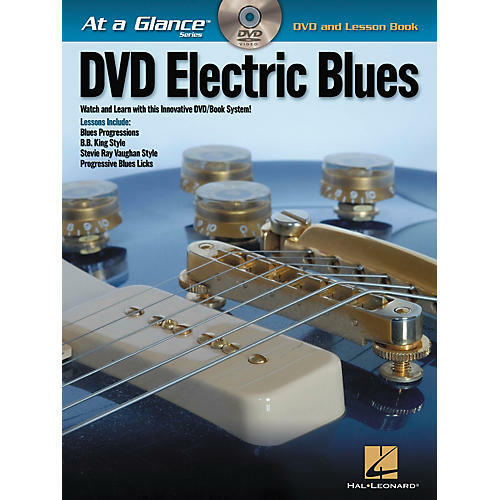 A ground-breaking DVD and softcover guide for anyone interested in expanding their knowledge of Blues guitar. A first of its kind, the At a Glance series pairs an instructional DVD lesson taught by a professional guitarist with a supplemental book for a comprehensive learning experience. Each book/DVD features several lessons pertaining to one topic, and the hi-def DVD lessons feature on-screen music. The lessons are loaded with valuable tips and information, and popular song examples help to demonstrate the concepts in action. Electric Blues - At a Glance features these lessons: Blues Progressions, B.B. King Style, Stevie Ray Vaughan Style, and Progressive Licks. Songs include: Ask Me No Questions • Cold Shot • Couldn't Stand the Weather • I'm Tore Down • Just like a Woman • Mama, Talk to Your Daughter • Sweet Home Chicago • Thrill Is Gone • Tightrope • and more!